From the upbeat Brian Eno-like choral richness of the title track to the witty and wild vocalese rendition of Mozart's 40th Symphony, Grammy-nominated songwriter Gunnar Madsen once again creates music the whole family can enjoy together. "Different from any other children's album out there, and all the better for it." Some kids never grow up! That can be a good thing, as evidenced by the latest CD from Gunnar Madsen. The Grammy nominated singer-songwriter, author and filmmaker has built a reputation for smart indie music and books for kids. This release adds a new dimension to the family music genre. The 15 new songs are lyrically and musically rich, working on multiple levels, making this an album the whole family can truly enjoy together. From the upbeat Brian Eno-like choral richness of the title track to the catchy calypso vibes of “Sun Comes Up” (in a beguiling 7/8 meter); from the drunken cats of “Bowl of Milk” to the rockin’ librarians of “Library Party”; from the guy who’s allergic to waltzes to the amazing vocalese rendition of Mozart’s 40th Symphony, the recording reveals Madsen’s wide-ranging compositional skill and witty yet soulful way with lyrics. The colorfully illustrated I’m Growing CD package includes 16 pages of liner notes, including full lyrics and artist comments, making this a great gift that listeners will want to pore over. Madsen offers his playful humor and excellent musicianship in every song. He clearly hasn’t lost his sense of childlike wonder. “I still get the biggest thrill from learning new things,” he says. ”I may no longer be growing any taller, but my heart and mind continue to grow and surprise me.” Madsen lives in Berkeley, CA with his wife and 5 year old son. He says nearly full-time parenting has added a new dimension to his songwriting. When you listen to his music you realize Gunnar has the wonderful awareness that on his journey through life he is many things at the same time: child, parent, teacher, student, witness, human. Now, that journey is no different from the rest of ours except that Gunnar is able to chronicle his with humor, warmth and some damn catchy tunes. In some of his prior CDs Gunnar has visited waltzes (“Spinning World”), jazz/rock (“The Power of a Hat”) and children’s songs that can be silly or thoughtful or usually both at the same time (“Old Mr. Mackle Hackle” and “Ants in My Pants”). Each of these is worth checking out whether or not you are a parent and regardless of your children’s ages. 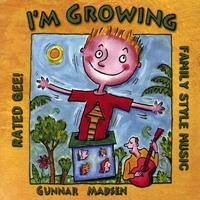 With “I’m Growing” Gunnar manages to pay homage to where he’s been on his earlier works (a bass voice familiar to BOB’s fans rumbles through certain tracks, cats receive the same insightful analysis as have dogs before them and waltzes continue to stick in your head), be present with where he is now (“Sun Comes Up”, “Cutest Little Guy” and “Tonight”) and cast a hopeful eye towards the future (“Raise Your Voices”). Mozart and librarians also get their due in his inimitable fashion, and the traditional song “Shenandoah” reflects the soulful interpretation that “Home on the Range” (from “Ants in My Pants”) and “Naïve Melody” (from “the Power of a Hat”) received before it. Gunnar’s liner notes for each song also lend unique insight. Yeah, I’m a fan, I reckon. Give "I'm Growing" a listen and you’ll be too. ...and that's a good thing. As a kid I loved the goofiness of Roger Miller and Harry Nilsson's theme to "The Courtship of Eddie's Father". Kids innately understand the "joie de vive" inherent in that music and Gunnar Madsen carries on that tradition here. Sure it's wacky but also very smartly arranged and produced. Check out more than one sample as each track offers refreshingly different influences. I love this album (and his earlier albums for kids) so much that I listen to them when there are no kids around. It's wonderful -- beautiful music, clever lyrics, and a sense of respectful playfulness that I don't always feel from other makers of kids' music. A caveat about the recommended if you like list: I adore Ralph Covert and Peter Himmelman, am lukewarm on Dan Zanes, don't like Laurie Berkner, and have never heard Harry Nilsson. Gunnar Madsen is up there with RC and PH in my personal musical pantheon.